Another 42 day special, a quarter of the Nepal GHT. Langtang to the Rolwaling and Khumbu, delightfully cultural with some serious, high passes. What are you waiting for? In case you didn't already know, Tilman's Pass and the Tashi Labtsa are serious mountaineering passes and, together with Paul and Celesta, having crossed all of the "high" route GHT passes we can say definitively it is definitely better labelled the "Extreme" route. We were certainly reminded of that. Luckily for Tilman's snow conditions were good, the weather perfect and the crew competent, and the 300+m of rope was almost enough. Surprisingly it wasn't the pass that gave us grief, but route-finding after Panch Pokhari. The Extreme GHT route goes to The Last Resort, rather than the more popular route down, and we got lost with an steep bush bash with a bit of bamboo abseiling to get down to the bottom of a valley. With unclear directions and a wrong map and guide book, it turned epic as we descended down on a non-existent trail, our very first midnight trek. I saw the eyes of a bear and thank goodness nobody was injured over the ridiculous terrain, even if Paul did fall off the first bridge (!). Thanks also to Dhirendra and Lhakpa, especially, for superstar efforts. The adventures continued with another afternoon getting lost session. Somehow all 40 of us missed the main trail, if there was one, and we couldn't find a guide on the main day of Dasain (the biggest holiday of the year). So we camped in a kharka to the surprise of the crone there then found a good trail the next morning. We still arrived for our rest at the Last Resort on schedule. Sadly Ole, Henning, John and Esther had to leave, and Tom and Emma also bailed, finding the trekking tough and emotionally tough but wouldn't you know, it suddenly got easier. Our bridging section between The Last Resort and Jagat was a series of comfortable half days, and even the day we did two days in one was easy enough. From Jagat we decided to take the more adventurous and more scenic upper route, avoiding the road, and had three pleasant camps before Beding. Instead of spending two nights there, we spent three at Na, the sun lasts much longer. After dropping loads higher, the porters returned (only three days back to their village!) and the sherpas and kitchen crew humped big loads. Luckily the trail was in surprisingly good condition and the weather - PERFECT, for weeks on end. We ended up crossing a few days early and Paul and David lounged around, luxuriating in Namche. Celesta had other ideas though and we slept on top of the Renjo La (yes, to everyone's surprise, on the very top, no tent) for a wonderful moonrise (ummm, having missed the sunset) and also on the very top of Gokyo Ri, where we did catch sunset and sunrise. Congratulations - basically Paul, Celesta and Jamie have trekked the entire GHT Nepal section extreme route! A delightful loop of peaceful camps, picturesque villages, fascinating gompas and high passes with gorgeous panoramas, and probably the best three week adventure in Ladakh. The ultimate in our Indian Himalaya explorations, a Tibetan Buddhist 'kora' through pristine nomadic regions, sparkling river canyons and over high passes trekking through Ladakh's most remote regions and villages. Real adventure & great trekking. For the not so superstitious, climb Ladakh's highest accessible peak. We have the best Lungser Kangri itinerary, glorious trekking on a route that makes sense, a balance of sound acclimatization, plus a confidence-building warm up 6000m peak. Join us! Another superb trip on all levels. Success almost all round on the first 6226m peak, so much so Paul and Marischka were happy with that and the trek; sadly Ashby cracked a rib or two coughing so wasn't able to head to 6666m, and Ranjan's back played up (they all returned from Tsomoriri) so it was left to Olivier and Garry to salvage our reputation on Lungser Kangri, which we did in less than 5 hours from our good high camp (quicker than any other team, thanks to sound acclimatization), even if the dog beat us to the top. With 15cm of new snow, we didn't even use crampons! Our exploratory Tirido start worked well without meeting another group, even if not exactly as planned due to ambitious horsemen. Those open spaces littered with kiang... And we saw Tibetan Argali sheep (Marco Polo sheep), Lobsang's and myself's (and our trekkers) first ever sighting, so rarer than snow leopard. A fox also wandered around our camp, and Garry, a birder, spotted no less than 34 species. We suffered one ordinary campsite at Thugje (will avoid next time), the rest peaceful and pleasant. The often cloudy and stormy weather was photographically captivating and luckily the raincoat only came out once or perhaps twice on the trail, although hail clattered and rain splattered many nights, and while we had relatively mild conditions, parts of India we hammered with deadly flooding. The trekking was definitely good, mostly superb, those glorious open valleys ringed by subtly colourful hills and mountains and the peace of naturally tired muscles and healthy meals. A bit of a detox for most of us. And a big thank you to Lobsang, Punsok, Ram Lal and the rest of the crew. Logistics were smooth as silk (except the road engineers who blew out more than they expected so a delay of a day in pickup) and coming over a rise to a camp already set up, tea and snacks ready, was a joy, and we didn't need head torches, unusually for a Jamie exploratory trip, only two minor misjudgments on timing. And back to the trekking fare, the special Manali red rice or top quality basmati rice and those subtly flavoured dishes, always a pleasure to eat, and probably the best there is. I know we will see everyone back - thanks! High, high, high! We explore the spine of the Ladakh Range aiming for an uncrossed 5850m pass and will probably scramble up a few 6000m hills too. Great altitude training, surprisingly grassy camps, a Pangong Lake bonus and real exploration! Sadly cancelled due to all members independently changing plans, unusual luck. A new route! Following caravan routes of yore over Himalayan passes and through the Changthang plateau, ours is one of Ladakh's most remote and challenging treks. We journey through the spectacular region of high lakes, ford sparkling rivers and camp with the nomads, with snow-capped Himalaya peaks as a backdrop for our green, beautiful campsites. Across Zanskar has always been the classic trek; we avoid the new roads as much as possible with two adventurous variations that few dare for mesmerizing views, stunning wild camping and pretty villages. The updated classic. What a trek! This was a Zanskar Spring trek of Joel's yore, and we had to hunker down as some unusual storms came though (destroying Kedarnath), so began a few days later with an epic crossing of the Shingo La, poor horses up to their bellies in parts. Lobsang had to cut their loads by half, dumping gear near the top and sleeping with it, then the crew went up the next night to retrieve it, amazing dedication. The rest of the trip was spectacular, both a stunning variety of scenery, and a real adventure. The Zanskar Traverse is still one of the very best treks there is, a spiritual and panoramic journey and it is a shame that we have so few people along. Oh, did I mention the meals? Punsok was on top form, it really was gourmet trekking, and Lobsang had everything superbly arranged. And wildlife... Filip saw a snow leopard! Yes, it was the trip of a lifetime! Check out Jamie's 2013 Zanskar Traverse Flickr set, and do +1 or fav photos and comment! Upper Dolpo, a Tibetan border region of hidden villages and monasteries tucked away in remote Himalayan valleys, is Nepal's Shangri-La. Join our explorations to the most far-flung of Dolpo's destinations - Shey, Phoksumdo Lake, Panzang valley & the high route to Mustang. Stunning! 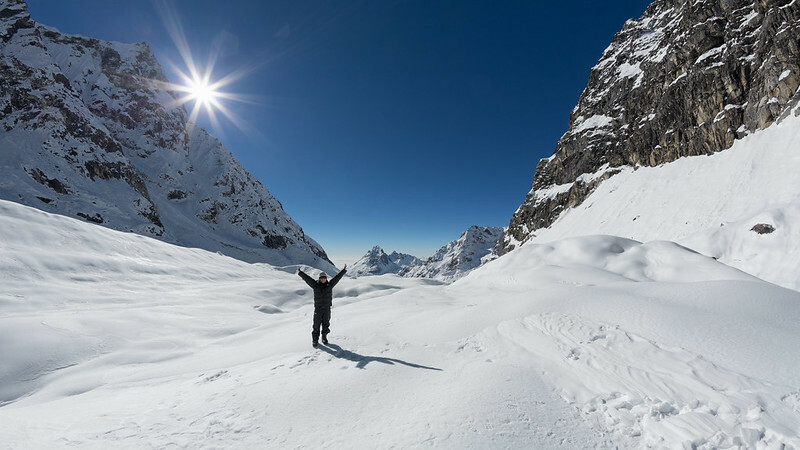 We are opening up new trekking peaks, one at a time. Be part of the fun as we trek through the most gorgeous, sculpted rock panoramas and remarkable ancient gompas, and climb a hopefully straightforward 6000m peak or two, real peak exploring. See Jamie's Flickr photo album 2013 Upper Mustang Exploration. I felt like we were deciphering a treasure map so exploring around Upper Mustang turned out to be a frustrating experience for some, but fun for others. Essentially we could not easily get to the peak, and on a backup area we bailed just as it started to get interesting (or frustrating, depending on your point of view). We have added a few more trails to the maps (literally) to an area that is surprisingly under-explored, at the very least. In detail, first we trekked the Tiri high route via Tshumpag to Samar which was physically tough and had one tricky section for the mules, Karma and Rakesh has to rebuild a section of the trail. Acclimatization on this quick jaunt to ~3800m will likely also be an issue for some trekkers, although wasn’t for us. After a series of pleasant camps and lodges we explored Lo Manthang then the exploration began. We found the legendary Cho Dzong Gompa, and what a trek there, too, and was a real highlight of the trek. The gompa is in a sad state though. Heading to Gaugiri we found trails not on the map but also multiple difficulties. We could have risked taking the mules through a canyon still filled with spring ice but above was a 5700m pass, definitely not possible for the mules and might have been a challenge for a couple of members. The mules would have had to cross into Tibet and back again, something we didn’t want to risk, and finally our exit was still rumoured to be blocked with snow, as indeed it was, we found later, so rerouting was the best option. Nestled in the far east of Nepal is one of Nepal's most spectacular trekking regions. 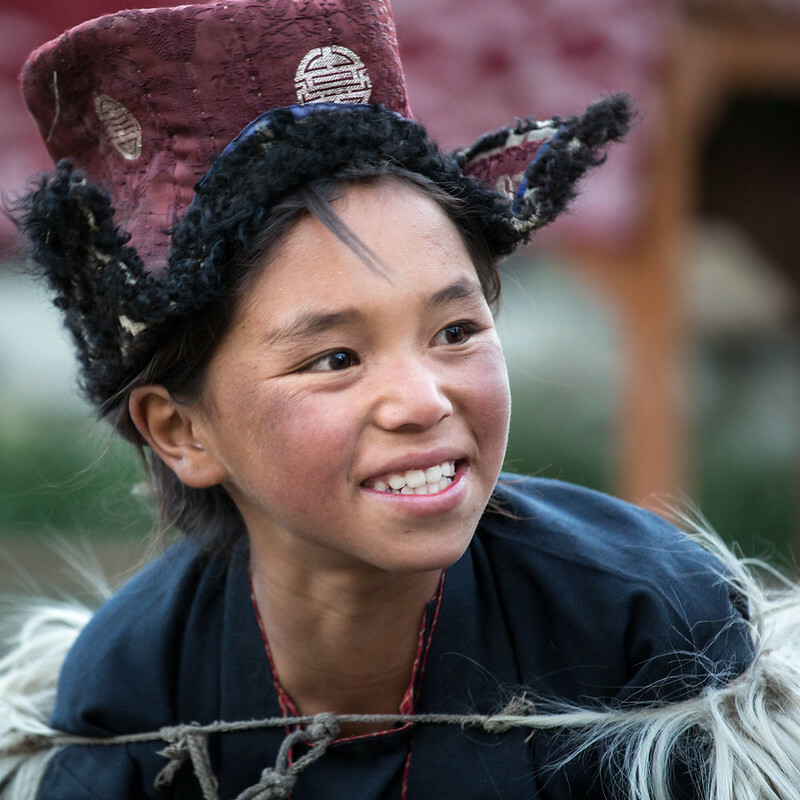 In addition to the north and south base camps we head off the beaten track to Olangchun Gola, as we explore this region of Rais, Limbus and Tibetans. I just completed the 2013 trek with Ade and the experience was spectacular. Ade and Lobsang were great and the dialed in support was what makes the expedition so special.